Investec Property will be pioneer development within the multi-billion rand Cornubia project in KwaZulu-Natal, following its acquisition of 13ha of land for retail. Architectural plans for the 90 000 square metre shopping centre are in their final stages of approval. Investec Property’s Ronnie Sevitz says the new location and the innovative design of the centre are attracting interest from prospective retail tenants. “This momentous project has been in the pipeline for over two years and we are thrilled to be able to share our building plans for Cornubia. “We are engaging prospective national retailers and hope to be able to break ground in September 2013,” says Sevitz. Cornubia itself encompasses the mixed-use development of 1 200 hectares of land, set to change the skyline betweenUmhlanga and King Shaka Airport over the next 20 years. The enormous total land space that comprises the Cornubia development, currently owned by Tongaat Hulett, will be dedicated to the development of bulk commercial, industrial and mixed-use areas with a focus on bulk commercial. Commercial development is comprised of 240 hectares, industrial 200 hectares and mixed-use 745 000 square metres. The site acquired by Investec Property is located within the mixed-use node of Cornubia, which will include office and retail developments. This part of the development is conveniently situated close to existing business precincts. Commenting on the proposed design, Sevitz says they had worked closely with the architects to create a space that would enhance the shopping experience. 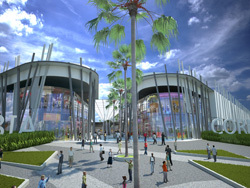 The unique design incorporates the convenience of a retail park combined with the sophistication of a mall. In addition, the road network is integrated as part of the development so that shoppers can park and find their way into the mall with ease. Interspersed among the shopping areas, will be a series of piazzas and landscaped open spaces, which we expect will make this a popular area and key asset for Cornubia and the surrounding areas, he says. Cornubia will bring new meaning to the concept of retail lifestyle estates, it is new and exciting and we are extremely proud to be leading the way, he adds.